An over-arching principle reason to engage the services of a call tracking provider such as Delacon is the ability to capture in your reporting tool, conversions from both online submission forms and calls. 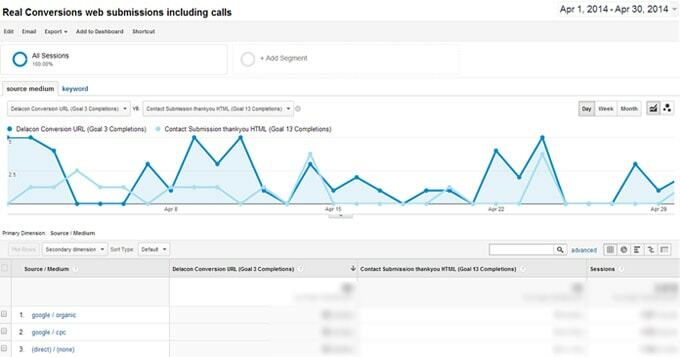 If you’re using Google Analytics, the analysis of clicks and calls is made even easier courtesy of the platform’s custom reporting functionality. One option is create a custom report that pulls two conversion goals onto the same chart. In this case you’ll be able to see click conversions and call conversions together. In Google language you’re adding two different metrics – for calls you need to select the goal created that registers that call. We recommend calling the call goal the Delacon Live Conversion. For clicks, you need to add the submission form goal you created – it might be for example the success page such as /thank_you.html. It’s best to select two dimensions for the chart. You should select source/medium and you should also include the keyword. When you access the report from the customization menu, you’ll then have the option of analysing the volume of conversions against the source and the keyword. Another option of viewing both clicks and calls on one screen is to create a custom call dashboard. This single screen view works on the same principle as the chart – by using the completion of the goal to pull through data. The dashboard is essentially a series of widgets. On one side you can display total calls by isolating the Delacon virtual page and on the other side you’ll show the total clicks by telling them system to only count the success page for submission forms. You can then select total calls and clicks for any date range. In addition to the volume metrics, you can also build separate widgets that show the volume of conversions against the call and the click source, the keywords that were used and the landing pages. This is a great way to see an overview of the how your campaign is progressing and which sources are performing the best. Based on these top line measurements, you can then drill down further to make appropriate optimisation decisions based on all conversion data.